We’re in the homestretch before playgroups and schools begin, which means mommies everywhere are finding ways to entertain their kids. Also, it’s been really hot, so outside play isn’t always a choice. However, letting kids develop cabin fever can really wreak havoc in the home. So, what can we do when it’s hot outside, but the kids need something to do? Museums are good, but oftentimes they cost a pretty penny, and so are not really an option. Here are some low-budget activities I have had success with. Keep in mind that my children are 10 months and 2.5 years, so if your kids are older, these may not be so applicable (but I’d love to hear what works for you!). I picked up two packs of 12 party balloons (what distinguishes then from regular balloons is beyond me, but, hey) at a discount supermarket. You can probably find some at a dollar store, or maybe even the dollar bins at Target (love those!). If they cost a dollar, that means each balloon only costs 4 cents. That’s pretty good. Balloons are actually quite versatile. 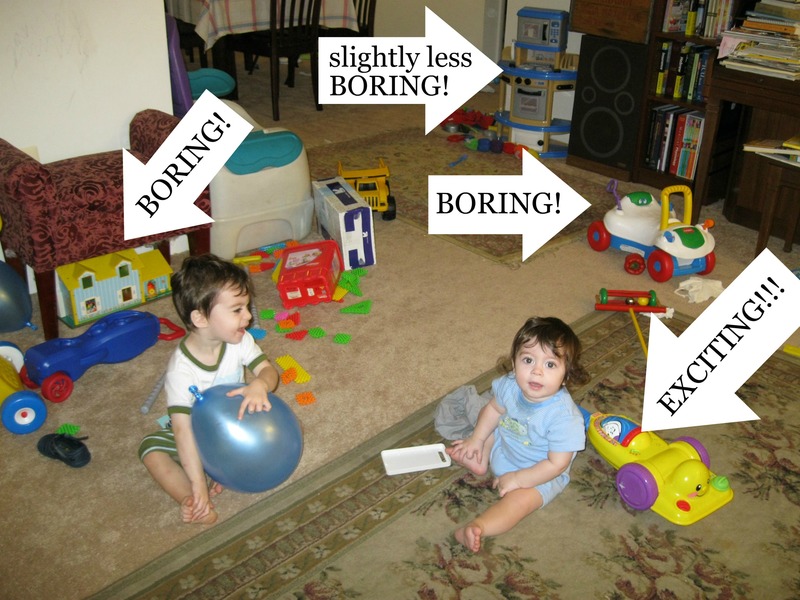 My kids like it when I blow them up (a funny sight on its own, really), and then let them fly all around the room. Giggles and squeals abound with that simple trick. Another method is to blow them up, tie them, and let the kids bounce, catch, kick, whatever, to their little hearts’ content. Also, my boys like to pop them. Not for every kid, that. Yet another fun thing is to blow them up and as you let the air out, pull the opening taut so the escaping air makes a funny, high-pitched sound. Depending on how tightly you pull, the pitch will vary, so you can experiment with different sounds. We like to blow lots of little bubbles and try to catch them, or, Little Man’s favorite, blow a really big bubble, and then pop it. Usually this popping is in my face, but, hey, I just close my eyes. Bubbles can come in the simple, old-school form (that’s the most inexpensive option), or you can go fancy-style, like with the Fisher Price Bubble Mower . There’s even a no-spill bucket option, if you want to be able to walk away from the kids while they are busy with the bubbles. While writing this post, I found a website about how bubbles aren’t just fun, they’re good for your kids. Neat. This is the most economical option (it’s totally free), but it takes a bit of organization and effort. I wish I were better at toy rotation, since the times that I have done it, it’s been great. Why is it so great? Well, there’s this principle that no matter how cool your toys are, since they are in your house, and seen every day, they are BORING. It’s a truth of the world, don’t ask me to explain it. However, if you hide the toys for, say, two weeks, when you bring them out, they are EXCITING again! This excitement could last for as little as five minutes to as long as, well, a long time, depending on the kid and the toy. I’ve found that saving certain toys for Fridays, when I’m getting ready for Shabbos, and the kids seem to need/want my attention much more than any other day of the week, is an effective strategy. The hardest part of toy rotation, for me, is actually putting the toys away. In reality, it’s not that much more effort, but by the end of the day I don’t always feel like going the extra mile. When I do, though, it’s so worth it. A key component is to keep the toys in a place that is outside of the kids’ room. Store them in your closet, the guest room closet, attic, basement, wherever you have storage space. It’s important that the kids don’t see them (and then immediately want them because they are EXCITING!!!). …and by then the original train of thought is usually forgotten. It’s still nice to be around other adults, and it’s nice for the kids to play with other kids, and, maybe more importantly, other toys (see #3). An interesting phenomenon is that when we play at our house, my kids’ formerly BORING toys somehow regain EXCITING!!! status when other kids want to play with them. I’m not sure who came up with this one, but it’s pretty brilliant. 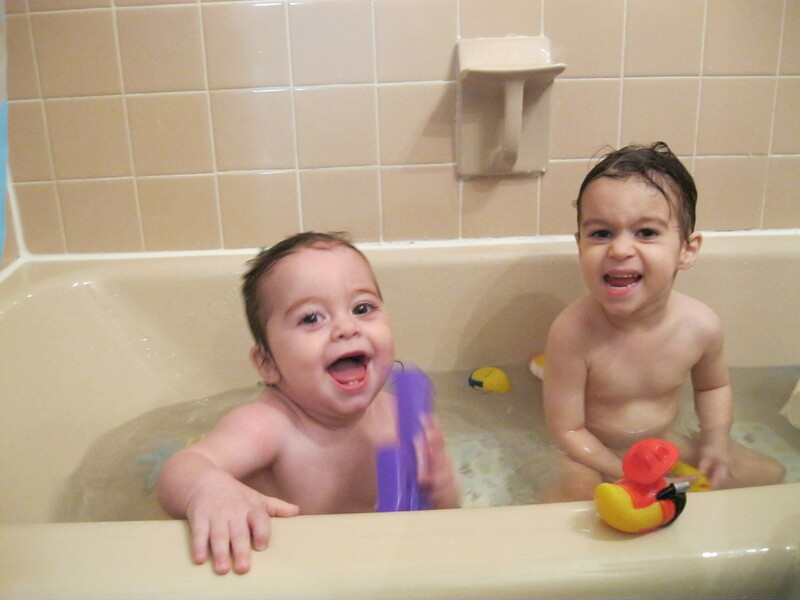 It requires constant parental supervision, since it is the tub, and with toddlers, the water is gonna get turned on. I keep the water level to a trickle, and then my kids don’t get soaked, but get to play around with bath toys, which are much more fun than their regular toys, by virtue of them being seen less (again, see #3). Why don’t I just give them a bath and do the whole two birds/one stone thing? Well, kids without diapers in the tub for extended periods of time makes me nervous, what with my previous uber-gross bathtub experience. So, I like to keep things nice and sanitary. Clothes on, fun had by all, no messy clean-up. The libraries in Cleveland are amazing. They have lots of room for kids to play (and it’s encouraged! ), a great selection of books, story time, activities, and so on We loved it. I hear the libraries in Baltimore are good as well, though I have yet to try them out. Besides being free and air-conditioned, another thing I like about libraries is that it makes being around books normal. The more I can expose my children to reading and learning, the better! Also, there are usually other mommies around with other little kids, so it can be a chance to socialize. After lots of running around and playing with blocks, or whatever, you can check out some books to take home and read that night. Depending on your child, you could also involve them in picking out books they like (just make sure to screen the book first to make sure the content jives with your parenting philosophy). Also, in Cleveland, the library had puppets and stuffed animals that you could also check out (unless you’re a germophobe, and then I wouldn’t recommend it). Okay, those are six of my go-to indoor activities for kids. What are some of yours? Watch those balloons! 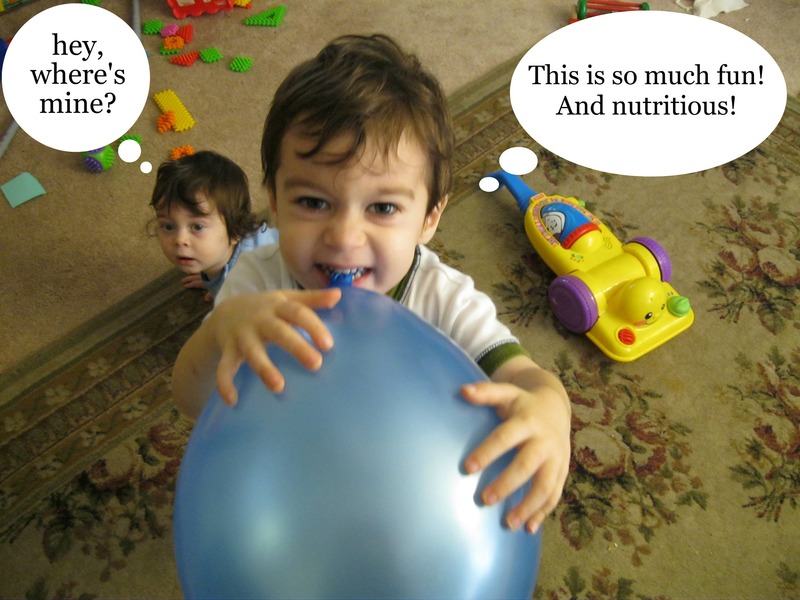 They can choke on the little pieces, so remind your readers to supervise very carefully – sorry to burst your…balloon! thanks for the tip, Joan, I will update the post!! my kids are older than yours but here’s our list. Keeping a constant rotation of the above going with breaks for food and tickle time keeps us going. With my kids’ behavior what it is, I can’t always take them out by myself (CERTAINLY not to the library or mall or playground). the kids have to agree on one website and take turns sitting on my lap choosing the games. we also have about a billion ipad apps but I try to keep those for doctor’s waiting rooms. wow, Heather, you are a veritable encyclopedia of activities! Thank you! great post! what do you do with preteens. Great suggestions! Sophie loves bubbles. That’s worth hours of entertainment. And we have the same Little People’s old-school house. It was mine as a kid and now it’s Sophie’s I love it! The house is from my childhood, as well! My mom was excellent at saving toys. I have tons of old toys that really get a lot of use (until they’re boring, that is). Thanks! I have a lot of fun with them. Thanks! We *just* discovered a new use for balloons tonight: Turn on a standing, rotating fan, and watch the balloon get blown around the room. 20 minutes of good, old-fashioned fun! So sorry about the lack of balloons at TJs. Disappointing, that.